Some predatory dinosaurs used guile and agility to outwit their feathered prey according to research. The work, by a Canadian-Chinese team, is published in PLoS One. 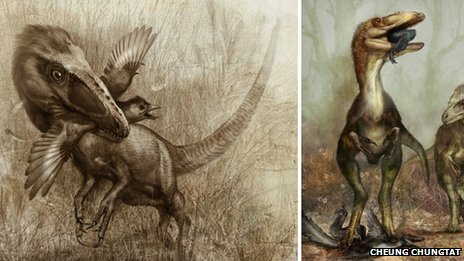 Researchers studied the fossil remains of two Sinocalliopteryx dinosaurs and found they had been feasting on primitive birds and flying dinosaurs. The prey could have been scavenged, but they argue that the presence of several birds in the stomach of one fossil implied the prey was actively hunted. The researchers suggested that to catch their prey, the dinosaurs used ambush hunting techniques similar to modern cats. Determining how dinosaurs lived is difficult - much of what we know is conjecture; built from a smidgen of material evidence and prodigious amounts of informed opinion. Fossils provide one of the few tangible links back to the Cretaceous and Jurassic eras - when dinosaurs ruled the Earth. They represent a petrified and rudimentary snapshot of prehistoric life. Good quality fossils are littered with clues that help palaeontologists rebuild dinosaur life. And fossils harbouring vestiges of a dinosaur's last meal tell us much about the diets and feeding habits of these prehistoric creatures. As Prof Mike Benton of the University of Bristol points out:"Any fossil with stomach contents is valuable because it tells us definitively what the animal was eating on the day it died." Dr Phil Bell of the Pipestone Creek Dinosaur Initiative in Canada was particularly interested in the feeding habits of a species of dinosaur called Sinocalliopteryx gigas. Sinocalliopteryx is a member of the Compsognathidae family of dinosaurs. Compsognathids were ground-dwelling dinosaurs that walked on powerful hind legs. Previous fossil finds suggested they were swift hunters feeding freely on lizards, dinosaurs, and mammals. At 2.5m in length, Sinocalliopteryx was much larger than other members of the Compsognathidae family. Two high quality Sinocalliopteryx fossils were recovered from the Yixian Formation in the Jehol Provence of north east China. This formation - dating back to the Cretaceous period and rich in fossils - has yielded a number of significant dinosaur finds. Trapped within the first fossil were the remnants of a single Sinornithosaurus - a feathered flying dinosaur, measuring about 1m (3ft 4in). This was tantalising evidence that these ground dwelling dinosaurs ate flying creatures. Findings from the second fossil were even more revealing - inside were the preserved remains of two primitive crow-sized birds, called Confuciusorni. Commenting on the significance of his find Dr Bell told BBC News:"It's so rare to get a glimpse into how dinosaurs - animals that have been extinct for millions of years - behaved. We now know more about the diet of this species than any other dinosaur." Two specimens, both containing flying prey, suggested that Sinocalliopteryx had a penchant for aerial quarry and also had the tools to catch them - but how? Dr Bell's view is that the dinosaurs were wily hunters:"Cats are a perfect example; they are incredibly stealthy, stalking their prey before pouncing. "I can imagine a Sinocalliopteryx stalking a bird through the underbrush waiting for the right moment to leap into the air and catching a bird mid-flight. "They were elegant animals with long muscular legs and sharp"chompers" - perfect killing machines." Prof Jingmai O'Connor from the Chinese Academy of Sciences, agrees:"Yes, the presence of more than one Confuciusornis suggests Sinocalliopteryx was a stealthy and adept predator." A view shared by Prof Benton, who thought they might hunt by"creeping up on these agile birds, perhaps when they were feeding on the ground". However, this conclusion has not gained universal approval. Prof Zhonghe Zhou, also from the Chinese Academy of Sciences, said:"I am not quite convinced by the conclusion that Sinocalliopteryx was necessarily an adept stealthy hunter. "It was undoubtedly an adept hunter, and could have been stealthy, but there is not yet enough evidence to support this." Dr Jakob Vinther, of the University of Bristol, agrees:"The fact they were having a diverse diet of both small and large dinosaurs and primitive birds could suggest that they were not specialist predators but more likely a scavenger - a sort of vulture". Although,"The finding of two bird specimens in the same Sinocalliopteryx does bring the potential that it was actively hunting them. "The only way to strongly argue for this hypothesis would be to have more evidence", he added.